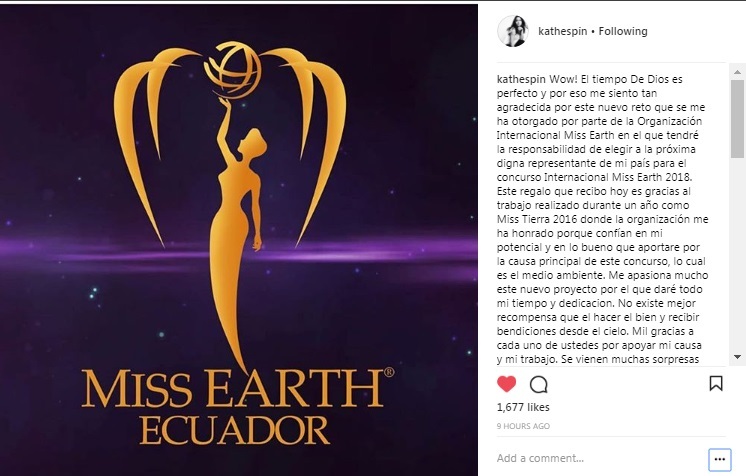 Miss Earth Pageant is delighted to announce that Miss Earth 2016 Katherine Espin has been appointed as the new National Director of the Miss Earth Ecuador (Miss Tierra Ecuador). Katherine takes over from José Hidalgo León, the former National Director. Katherine represented Ecuador at Miss Earth 2016 in Manila, Philippines and won the coveted title, getting Ecuador's second Miss Earth title. Ecuador has produced 2 Miss Earth winners: Olga Alava in 2011 and Katherine Espin in 2016; and 1 Miss Earth-Air Jennifer Stephanie Pazmiño Saldaña in 2010. Wow! The time of God is perfect and for that reason I feel so grateful for this new challenge that has been granted to me by the International Organization Miss Earth in which I will have the responsibility of choosing the next worthy representative of my country for the International competition. Miss Earth 2018. This gift that I receive today is thanks to the work done during a year as Miss Earth 2016 where the organization has honored me because they trust in my potential and in the good that I will contribute for the main cause of this contest, which is the environment. I am very passionate about this new project for which I will give all my time and dedication. There is no better reward than doing good and receiving blessings from heaven. Many thanks to each of you for supporting my cause and my work. Many surprises are coming from which I will update them little by little. Meanwhile, Francys Barraza Sudnicka, Miss Earth Poland 2006 (she placed in the Top 8) is now the National Director for Poland! We wish both of you well in your new roles!